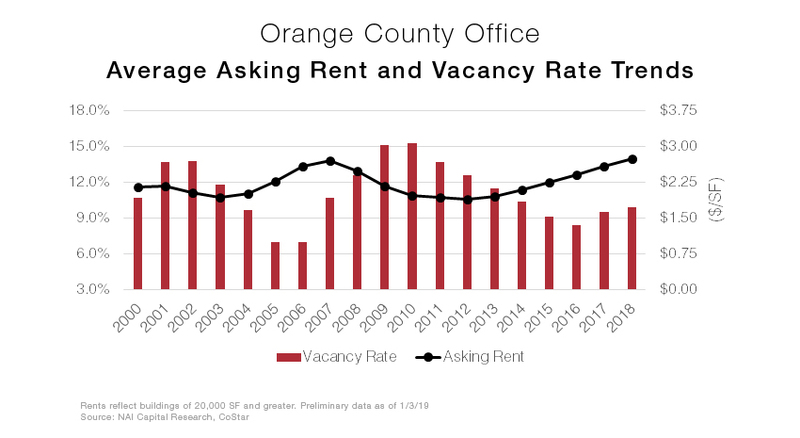 In 2018, average asking rent in the Orange County Office Market reached the highest level on record. In 4Q 2018, the average asking rent was $2.75/SF, up 6.2% over last year and up 1.9% from the prior peak of $2.70/SF in 2007. While the average asking rent continued to climb, the vacancy rate increased 40 basis points from 2017 to 9.9%, as more than 3.9 million square feet of completed construction were added to the market. Most of these deliveries were high-priced class A space. Orange County has historically been a strong office market with a diverse tenant base. Orange County also has the lowest unemployment rate in Southern California. Future growth is expected to moderate due to Orange County reaching full employment in 2018. Stay tuned for our 4Q18 Quarterly Outlook reports coming soon.